With 3 million Instagram fans and counting, Aimee Song knows a thing or two about taking the perfect Instagram photo. In Capture Your Style, Song reveals the secrets behind creating the ultimate feed and breaks down the technical and editorial essentials for creating an account that will draw thousands of followers to earn you likes and brand attention. Organised by lifestyle categories, including fashion, travel, food, decor and more, the book presents the best apps and filters for processing photos, improving your voice and capturing your story on Instagram. There is also how-to information for propping and styling food and fashion photos. 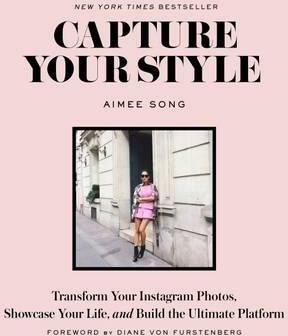 Aimee Song is the blogger behind Song of Style, a popular fashion and interior design blog. She is a sought-after consultant and collaborator with such luxury brands as Michael Kors, Diane von Furstenberg, Tiffany & Co., and many others. She frequently appears on national television spots for Cover Girl, E!, MTV and more.